In 2017, the Honda CR-V was redesigned from the bottom up, front to back, and inside out! It has changed so much after five generations that consumers are constantly left in awe. This complete new improvement has set the standard for competitors in the world of small SUVs in 2018. Can it get any better than being the 2018 Kelley Blue Book® Best Buy Award Winner for Small SUV/Crossover¹ Vehicles? 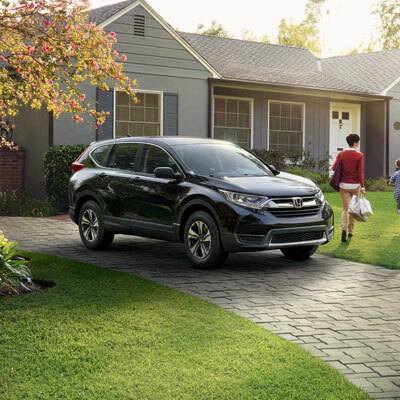 You are going to be the talk of the townships around Marlton, Turnersville, and Mount Laurel, NJ, when you drive a 2018 Honda-CRV. Learn more about this awesome SUV in our 2018 Honda CR-V review. With the turbocharged engine available on every trim, excluding the baseline LX trim, the 2018 CR-V has some tough punch in acceleration with the 1.5L engine. This peppy vehicle can take on the toughest roads with its smooth handling and steering. Honda went totally bold and beautiful with the new exterior face and body lift on this vehicle. The eye-catching shutter grille adds to its already-fabulous style and boosts the aerodynamics while you float around town. The sharp wheel options and LED tail lights are standout features that will make you feel like the coolest commuter in Marlton, Turnersville, and Mount Laurel. 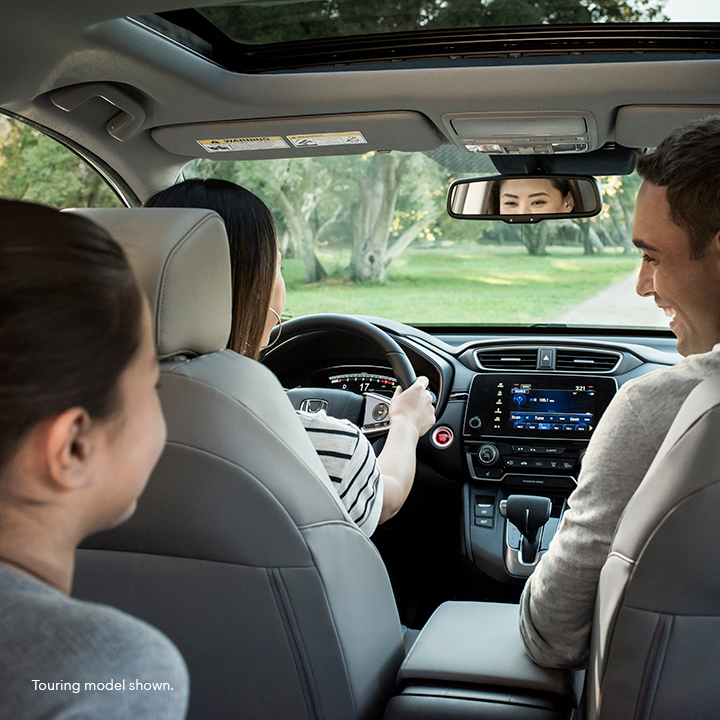 The cabin of the 2018 Honda CR-V has been upgraded to facilitate top-of-the-line interior comfort and convenience to enhance your cruising experience. The 2018 Honda CR-V has four incredible trim levels, starting with the base trim LX, followed by the EX, EX-L, and Touring. The LX CR-V is built with loads of standard features that would be an additional expense in other comparable SUVs: 17-inch alloy wheels, LED lights that burn during the day for extra visibility, a multi-angle backup camera, and 60/40 split rear seats that fold flat for additional cargo space; an exceptional starting place in the trim levels. The 2018 EX CR-V ups the ante a notch from the LX with a single touch power sunroof with tilt function, a single scroll 1.5L turbocharged engine, and remote engine start, to name a few. The EX-L has all of the standard features that the EX has, but it gives a bit more in luxury and convenience with a leather-trimmed interior, adjustable power seating, power liftgate, and a rearview mirror with automatic dimming. Finally, the Touring CR-V pulls out all the stops, offering everything the EX-L gives, and features hand-free futuristic conveniences like the rain tracker windshield wipers; the windshield wipers will turn on by themselves once they sense rain touching the windshield. The windshield wipers adjust speed according to the lightness or heaviness of the rain, and they stop automatically when it stops raining. Arms full of groceries? No worries with the hands-free power liftgate. Just swipe your foot beneath the bumper, and your liftgate opens. Whichever 2018 Honda CR-V trim level you choose for your needs, you will benefit where you are and where you’re headed on your journey. Burns Honda is so excited about the redesigned 2018 Honda CR-V that we would be happy to let drivers in Marlton, Turnersville, and Mount Laurel, NJ, put it to the pavement. Give our friendly customer care associates a call today to schedule a test drive and experience the power in this small, but bold, SUV today! ¹ Leading its class for the third time, Kelley Blue Book’s KBB.com named the 2018 CR-V Best Buy of the Year among small SUV’s and crossovers thanks to excellent safety features, superior room and impressive fuel economy ratings. For more information, visit Kelley Blue Book’s KBB.com. Kelley Blue Book is a registered trademark of Kelley Blue Book Co., Inc. 26 city/32 highway/28 combined mpg rating for 2WD LX with CVT model. 25 city/31 highway/27 combined mpg rating for AWD LX with CVT model. 28 city/34 highway/30 combined mpg rating for 2WD EX, EX-L and Touring with CVT models. 27 city/33 highway/29 combined mpg rating for AWD EX, EX-L and Touring with CVT models. Based on 2018 EPA mileage ratings, Use for comparison purposes only. Your mileage will vary depending on how you drive and maintain your vehicle, driving conations and other factors.